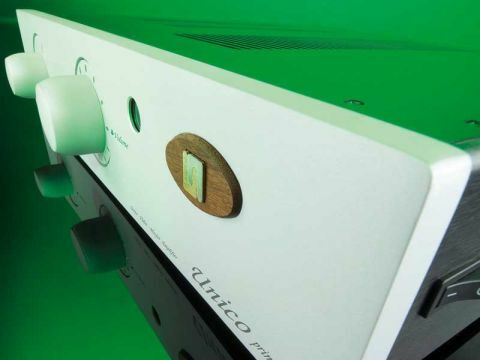 The Unico Primo is Unison's entry-level hybrid valve/transistor integrated amplifier and comes in a slimline housing with a finish closely matching that of the Unico CDE CD player. In fact, the two can be stacked vertically with minimal heat build-up, since both are relatively cool-running. The amplifier runs cooler than many solid-state models when idling and increased heat build-up when powered up is modest. The chassis is made from polished aluminium and acts as an effective heatsink, with louvres in the top panel adding increased thermal dissipation. The Primo has a power rating of 85 watts per channel RMS into an eight-ohm load under all conditions, though Unison states that output is higher for non-correlated signals – that is, for anything but steadystate tones. The model shares with its sister amplifier, the Unico P, a design based on a single double triode, in this case an ecc83/AX7 instead of the ecc82/AU7 combination used previously by Unison. This type of triode input stage is said to have quite different characteristics to the ecc82. Apparently the choice arose from technical and listening-based investigations initiated by Unison technical staff, based initially on existing models in the company's range which were modified to suit. Some improvements to the driver and power output stages have been made to suit the new input, with power-supply revisions including a larger, more powerful mains transformer and filter capacitor stage, with the intention of improving dynamics and bass-response drive capacity. As standard, the Primo is a line-level amplifier, with a total of four line inputs and one tape circuit. But there are a couple of additional features that may be of interest. One is the ability to convert a line input to an MM/MC phono stage, which will set you back a relatively modest £150 for an internal RIAA board – the phono input is already identified on the rear panel and is marked on the source selector. If you don't choose this option, the input is a standard line input, one of the four already specified. Valve amplifiers aren't to everyone's taste, even if they can be easier on the ear and more relaxed-sounding than solid-state models. And it's fair to say that some early amplifiers in the Unison Research range fall into the ambivalent category. But no such qualifications are required in this case. This is, by any standards (entry level or otherwise), a first-rate amplifier. For starters, it has an impressive power output. Not only does it go loud; it does so with some grace, and in particular it stays consistent in sound as the volume is turned up to quite impressive levels – tested on this occasion using a pair of Mordaunt- Short Performance 6 Le speakers. It's that tell-tale hardening of the sound as the volume output is increased that makes many amplifiers stand out for all the wrong reasons. That said, in most respects, there's nothing obviously valve-like in the sound of this amplifier. It could easily be mistaken for a solid-state design, if you didn't know better. It is, of course, solid state, in that the output stage uses MOSFETs, though they have the reputation of being the most valve-like of solid-state devices. But MOSFETs frequently don't live up to the stereotypes and lack a certain grace and transparency, which isn't an issue here. The first thing we noticed was that the Primo is unusually solid-sounding, and it has this quality at virtually any volume level, within the limits established by its output stage. This is an amplifier with real grip, which became apparent in one of the early tests using a new recording of Benjamin Britten's War Requiem (Helmuth Rilling, Aurelius Sängerknaben Calw on the Hänssler classic label in PCM and SACD). This was a real test in many respects, thanks to the way in which large orchestral forces and multiple choirs in the Requiem Mass are juxtaposed with a small chamber orchestra to partner the tenor and baritone soloists. Somehow, the Primo managed the clash of scales surprisingly well, and the result had a compelling unity of purpose, again with the solidity and consistency already referred to. Another quality the amplifier brings to the table is an unusually fine bass. It's rich but pure and unerringly tuneful, as well as being essentially free of the romantic haze that persists with some valve amps. You can hear this from the start of Mahler's 7th Symphony (played by the LSO under Valery Gergiev). This, like the Britten, is an SACD recording, or more correctly a multichannel hybrid recording, but it's a distinguished one that blossoms in high-quality DSD and therefore offers a performance level that's perfectly suited for this amplifier. The main qualities of the Unico Primo, then, are its generous output, its consistency with level, its tuneful bass and its ability to keep its act together when things become difficult and potentially messy – which is the danger with the dense and complex Britten recording. In addition, the Primo is an amplifier with a strong sense of detail and precision, the kind that sounds close even when the system is in an adjoining room. In short, it's a class act. It's not exactly swimming in toys and gadgets, but everything necessary for a purist amplifier is there (though admittedly there's no balance control, which some might miss). Other highlights include the ability to add a phono stage at a moderate cost and the fact that it can also drive a subwoofer in a 2.1 or 2.2 set-up. This is a very handy addition and one which should extend the amplifier's useful life beyond the point where it might otherwise be considered due for upgrading. The Unico Primo is also exceptionally well built. Though slimline, it still weighs a substantial 15kg, partly thanks to a massive toroidal power transformer, extensive use of die-cast heatsink extrusions and a thick one-piece front panel. We're less impressed by the remote control, however, which looks fine at first sight, but is marred by prominent fixing screws on the top plate and by the controls themselves, which are tiny and awkward to use. In its favour, though, this is the same remote that's supplied with the Unico CDE CD player, so you only need the one handset to control the entire system – leaving you one spare to lose down the back of an armchair.